Maycomb, Alabama. Twenty-six-year-old Jean Louise Finch -- "Scout" -- returns home from New York City to visit her aging father, Atticus. Set against the backdrop of the civil rights tensions and political turmoil that were transforming the South, Jean Louise's homecoming turns bittersweet when she learns disturbing truths about her close-knit family, the town and the people dearest to her. Memories from her childhood flood back, and her values and assumptions are thrown into doubt. Featuring many of the iconic characters from To Kill a Mockingbird, Go Set a Watchman perfectly captures a young woman, and a world, in a painful yet necessary transition out of the illusions of the past -- a journey that can be guided only by one's conscience. It's been more than a month since Go Set a Watchman was released, and I feel like the online fervor over it has died down. I pre-ordered the book several months ago after debating if I really wanted to read it. I love To Kill a Mockingbird and was thrilled by the idea of more, but I was also troubled by reports that it was being published against Lee's will. And honestly, I truly hope that she wasn't taken advantage of with this release. By now, you've probably read the complicated reports regarding the history of this book. Based on what I've read in the news, I believe that this manuscript was what Harper Lee first submitted for publication years ago. An astute editor realized that there was more potential in the story, and she helped Lee craft this manuscript into what became To Kill a Mockingbird. Although HarperCollins has marketed this as a "new" novel from Harper Lee, it's not. It's the precursor - the germ of an idea for this place and these people - but certainly not the sequel. The characters in this book became the people we meet in To Kill a Mockingbird, and not the other way around. Atticus didn't grow into the man in Go Set a Watchman - that's where he started and he ultimately became the version readers now know and love. I say this because I almost canceled my pre-order after reading the first early review of Go Set a Watchman. The claim that Atticus was a racist made me hesitant to read the book. I was afraid it would lessen my love for To Kill a Mockingbird, but I realized I needed to decide for myself. Here's the thing - the two books are intrinsically linked, but I don't think you have to let your feelings for one book influence the other. Before I write anything else about Go Set a Watchman, I want to say that this book didn't change my feelings for To Kill a Mockingbird in the least bit. And honestly, I think it's because of the way I approached this book. I didn't read it as a sequel, because it's not, or as a first draft of To Kill a Mockingbird, because it's not that either. I read it as the place Lee started - and nothing more. It gave me a deeper appreciation for Lee's editor. How incredible that she was able to recognize that there was a stronger story hiding in these pages! And I admire Lee for being able to take that advice and write a true masterpiece. 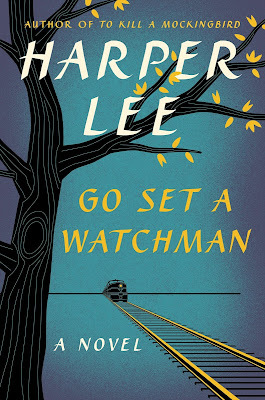 Go Set a Watchman is worth reading to see Lee's growth as a writer and the influence a remarkable editor can have on a story, but I doubt it would have become a classic if it had been published originally instead. It's a weaker plot, and the climax and ending felt a bit unresolved. The characters don't have as much life, but the spark is there. It's been a month since I read Go Set a Watchman, and I needed that time to sit on my thoughts. My first reaction when I finished it was somewhere between "I'm so glad I read it" and "I wish this had never been published." It was a difficult read, but it was also thought provoking. The tone is angry and bitter, and you can tell that Lee is wrestling with her own complicated feelings. Knowing that this book is semi-autobiographical made me look at it with different eyes. I read it as Lee's attempt to work through her reaction to her family and the South after coming home from New York. I understood how you can look at your hometown and the people in it differently after going away. If you've gone away to college, surely you can relate in some way. It was hard to read about what was going on in the South in the 1950s, but it would be worse to pretend it didn't happen. One of my favorite quotes in Go Set a Watchman is when Uncle Jack tells Jean Louise, "As sure as time, history is repeating itself, and as sure as man is man, history is the last place he’ll look for his lessons." I was sad reading this book, but it made me think about history and the ways it's being repeated today. I saw and was disappointed by the racism in Atticus (and Jean Louise), but they must also be read in the context of that time. It doesn't excuse it, but it does explain it. And maybe it can help us understand where we are today. Go Set a Watchman didn't read like a fully fleshed-out story, and I can understand why it wasn't originally published. Lee's writing style is lovely, but there's a lack of finesse and clarity in this story. I'm still not convinced that this should have been published, but I don't regret reading it either. I'd suggest checking it out from the library if you're curious and approaching it as the birthplace of To Kill a Mockingbird - but not its resting place. "Remember this also: it’s always easy to look back and see what we were, yesterday, ten years ago. It is hard to see what we are. If you can master that trick, you’ll get along." I read To Kill a Mockingbird for the first time last month, and after all the news about Go Set A Watchman (Atticus being racist, etc.) I wasn't sure if I wanted to read it. Partly, like you, because of the rumours that Harper Lee didn't want it to be published. If I were to read it any point, I would like to approach it the same way you did, so thank you very much for explaining your views and your take on it. I think it would be interesting to see where it all started, from a literary point of view, that's for sure. Perhaps in the future! You hit the nail on the head here! I am glad I read it and got to experience more of Lee's writing style. However the controversy this book caused almost prevented me from reading it, too. I'm glad it didn't! Ditto what Cassie said. I ended up being really, really glad I read this. I just finished GSAW 2 days ago, and I'm still trying to process my thoughts on this one! I agree with a lot of what you said above though! Very thorough review! This is exactly how i felt when i read it! I also thought the many reviews ahead of time hyped up the "racist Atticus" angle and made me so nervous to read GSAW. I'm glad I read it and made my opinion on it. I'm even more glad it will never take away what i feel for the original and for Atticus. The easiest way for me to look at it is almost as fan fiction, not cannon. Especially since some of the story-lines don't even match up to the finished product of TKAM. As I said before glad I read it but I don't think i'll ever reread. I'm not sure when I will have time to read this but I think your review really makes a great point about viewing this book as part of a writer's process and growth rather than as an independent piece outside of To Kill a Mockingbird. I feel like a lot of the frustrations people have expressed over GSAW probably stems from trying to make this book fit as a true sequel when really that's never what it would have been. Great review. I can honestly tell you that I'm not so interesting in reading Go Set a Watchman. For me, To Kill a Mockingbird will always have a special place in my heart as one of the "classics" I read at a young age, and one I enjoyed. Your review confirms that it might be a good idea for me to skip this one; perhaps I'll just reread To Kill a Mockingbird instead, and see how I feel about it now that I'm older!